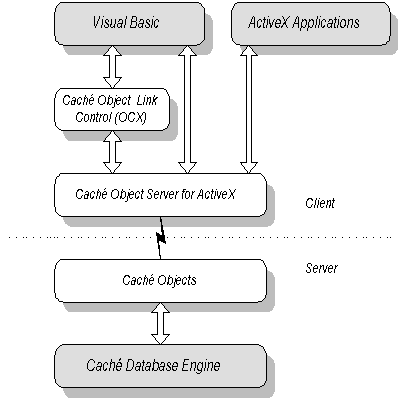 Caché Object Server for ActiveX  An ActiveX automation server that exposes Caché objects as ActiveX objects. Caché List Control  An ActiveX control written for Visual Basic that aids in the display of query results. You must provide the interface for selecting queries and query parameters for execution. Caché Query Control  An ActiveX control written for Visual Basic that provides a simple interface for executing queries and displaying the results. The Caché Query Control provides an interface for selecting at runtime any query that returns the ID and for specifying any query parameters. Caché Object Form Wizard  A Visual Basic add-in that allows you to quickly and easily create a simple form to access properties of a single Caché class.